Greek Yogurt Fruit Popsicles - A recipe from Savor California, the online showcase for extraordinary gourmet foods and beverages from California. Cut up the fruit into small pieces. Fill the paper cups about 1/3 full with pieces of fruit. 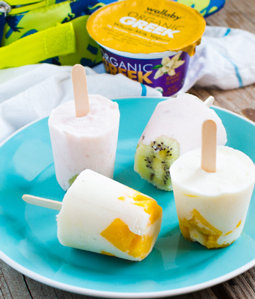 Place a popsicle stick in each cup and fill with Wallaby Greek Yogurt.